An upgraded QXR version of the standard Pre2 DAC, adding the ability to support 768k @32bit PCM and native DSD 512 formats alongside a range of latest premium digital inputs. Earn 1745 loyalty points when you order this item. 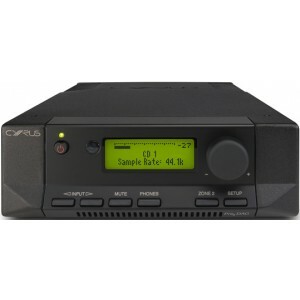 Cyrus Pre2 DAC QXR Pre Amplifier + DAC offers total control of analogue and digital sources, now upgraded with QXR for additional function, enhanced performance. It provides the perfect balance and a superior performance but can be further upgraded effortlessly via a PSX R2 module. A separate pre and power amplifier offers a new level of refinement for those wanting to build a reference-grade system. Running units with separate power supplies results in a cleaner signal as the inductive effects of the large currents in the power amplifier are isolated from the sensitive components of the pre-amplifier. The result is cleaner, more powerful and incredibly engaging. Rediscover your collection from a whole new performance perspective. The preamplifier circuitry has its own power supply which provides separation from the demands of other components allowing an additional level of dynamics and resolution. If a PSX R2 is connected, you will hear a leap in performance as the preamp is fed with a highly regulated and ultra smooth DC feed. The audio uplift enables the close tolerance parts in the pre-amp to be entirely appreciated through the benefit of the more even supply. Pre2 DAC separates the pre-amp into its own chassis and provides a discrete power supply to resolve more detail. QXR can process PCM audio up to 768k at a 32bit depth and ‘Native’ DSD 512 via the USB interface. Advanced ESS DAC features asynchronous upsampling to deliver a supreme audio signal from connected digital sources including PC, DVD player or TV. Whatever the source. Audio from Toslink and digital S/PDIF inputs are ‘reclocked’ to reduce noisy ‘jitter’ for an intricate, more transparent audio signal to the pre-amp stage. The Pre2 DAC is designed to be partnered with matching power amplifiers such as the X Power, Stereo 200 or Mono X 300 Signature. Build your system with a CDi or CDt and a Stream X Signature or Stream Xa for an exceptional music experience. Add a dedicated power supply such as the PSX R2 to further enhance the pre amp’s resolution.